First and foremost, I have a few biases that I need to get out of the way. 1) I love America. Not blind nationalism, but more so the ideal. 2) I sincerely believe sports and competition are immeasurably valuable vehicles to teach people critical life lessons and skills… the kind of skills that make people great leaders. 3) Take the above point and multiply it by 2,764%, and that’s how much more important it is for children and young adults. Trust me. It’s science. 4) Our children and young adults are the future leaders of America. 5) If we don’t change how we currently treat our youth athletes, the future leaders of our country are screwed. This is the model that ideal athletic skill and performance is built upon. 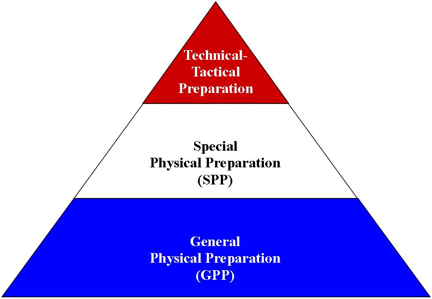 A solid foundation of GPP will consist of gross motor skill mastery, proficiency in relative body strength and the introduction of general strength training, and a healthy level of cardiac fitness… basically, getting good at the things a functioning human should be good at. SPP is where we begin to get more specific towards our individual goals: planes of movement, dominant energy systems, special strength training, etc. Finally, Technical-Tactical Preparation is the chosen sport itself. As an athlete progresses through his or her career, that triangle will morph into more of a square, with equal attention paid to all three components. 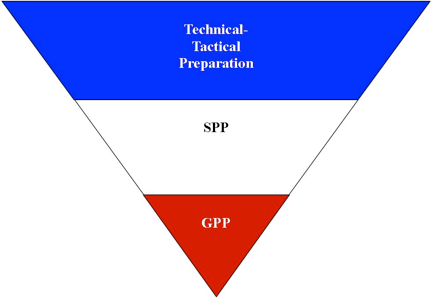 I’ll be the first to admit that I’m GREATLY oversimplifying things, but the take away message is this: as an athlete’s GPP improves, they’ll eventually reach a point of diminishing returns. At this point, their time and energy will be better served on activities with a direct relationship or a high degree of transfer to their sport (for more on this I highly recommend reading “Transfer of Training in Sports” by Dr. Anatoliy Bondarchuk). This is seriously problematic, and it has nothing to do with looking like a French flag. I didn’t use pyramids as an example by accident. A pyramid’s support is found in its base. If you tried to build one upside down, it wouldn’t work- it’d just topple over. The same is true with our physical construction. If you try to build complex skill on top of a poor or non-existent foundation, two things will happen: injuries, and less than optimal performance. I don’t know about you, but those are two things I’d like to have my athletes avoid. Here’s our reality. Kids don’t move. Gym is gone and the concept of outside play is all but dead, which is where children used to develop their GPP. These days, when they even are active, it’s entirely through their involvement in youth sports, and the vast majority of youth sports in this country are taught with a skill-intensive focus. Skill practice does have its place, don’t get me wrong. You still need to learn how to throw, catch, and swing a bat if you want to play baseball. You’re not going to be that great of a basketball player without learning how to dribble and shoot. Our problem is that has become the only activity our kids are getting. Preparedness is an afterthought. And in a strange way, the kids that have the greatest potential are the ones who are getting hurt the most. They get thrust into year-long competition well before they’re even remotely ready. If they do get any kind of additional physical preparation, it’s typically devoted to specific skill development. I’ve witnessed first hand 14 and 15 year old kids have to retire from sports because their childhood was dominated by one and only one activity, resulting in overuse injuries and burnout. When kids are forced to drop out of sports, or withheld from competition, they’re removed from the very environment that fosters problem solving, competitive drive, and healthy coping mechanisms. Not necessarily a great recipe for the future leaders of our country. I could write a book on how this happened, but I’m more interested in providing solutions. Here’s how we can rewrite that script. Every single person reading this right now has an opportunity to impact a child’s life, either directly or indirectly. As a coach, parent, grandparent, aunt, uncle, sibling, cousin, or friend, we all have the capacity to influence children. Educate those in your circle. Learn to speak their language. What parent wouldn’t want their child to be safer, healthier? What coach wouldn’t want to see their athlete’s performance improve in the short term while simultaneously laying the foundation for the long term? Sell the destination, not the airplane. Having been around the sport of football the majority of my life, that’s the vehicle I can use to best create change. I encourage you to check out the system I developed with a colleague of mine specifically intended to spark a paradigm shift in how youth football players are prepared (www.YouthPigskinPrep.com). While we chose to speak to the football community, the lessons we provide hold true for all youth athletes. And there’s no reason you can’t do the same. Take the sports and activities YOU have a passion for, and get active in those communities. The best way to create stronger leaders for tomorrow is to become a stronger leader yourself. As cliché as it sounds, we can’t afford to waste any more time. The future truly is now.